While Gerry has returned to Belfast to show off his stolen money, one of the squat residents talks to the authorities and the Conlon home is raided by the British Army and Royal Ulster Constabulary, who arrest Gerry as part of the Guildford Four and immediately place him on a military flight to the UK mainland. Gerry and his friend, Paul Hill, are interrogated by police who torture and threaten them until both finally agree to sign a confession after being held for up to seven days under the Prevention of Terrorism Act. Giuseppe, who goes to England to help his son, is staying with his Maguire family relatives in London when they are all arrested in December 1974. In the subsequent trial, the family (known as the Maguire Seven, including Conlon's father) are convicted of supporting the Guildford bombing on the basis of nitroglycerin traces, receiving long terms of imprisonment. The confessed Guildford Four, including Gerry, are sentenced to life imprisonment. Gerry's time in prison shows a progression from a bitter son who rails at his father until an awakening when he is approached by new inmate Joe McAndrew, the real perpetrator of the bombing. McAndrew tells the Conlons that he had confessed the truth to the police, who then withheld the information to avoid official embarrassment. When McAndrew leads a prison protest and then sets a hated prison guard on fire, Gerry is the one who saves the guard with a blanket. Gerry takes over the fight for justice himself when his father dies in custody. His case becomes public, gaining support from Dublin, Belfast and London. A common slogan used by his supporters is "Free The Four". Gareth Peirce, a campaigning lawyer who has been investigating the case on behalf of Giuseppe, has a breakthrough when she tries to access Giuseppe's file and is able to look instead at Gerry's. She finds vital police documents in the file that are marked "Not to be shown to the Defence". During the course of their appeal, the production of these documents leads to a triumphant scene in court when Peirce produces the evidence that the police have been lying throughout about the existence of a witness who had provided Conlon with an alibi during their initial investigation. This leads to the overturning of the verdict and immediate release of the Guildford Four. The film ends with a triumphant Gerry revealing his story to the media and proclaiming his father's innocence. Title cards reveal the current activities of the Four, the exoneration of the Maguire Seven, that the police were acquitted of any wrongdoing, and that the real perpetrators of the Guildford Bombing have not been charged with the crime. To prepare for the role of Gerry Conlon, Day-Lewis lost over 50 pounds in weight. To gain an insight into Conlon's thoughts and feelings at the time, Day-Lewis also spent three days and nights in a jail cell. He was prevented from sleeping by a group of thugs, who would bang on the door every ten minutes with tin cups through the night, then was interrogated by three different teams of real Special Branch officers for nine hours. He would also insist that crew members throw cold water at him and verbally abuse him. He also kept his Belfast accent on and off set. Day-Lewis has stated in an interview that he went through all this as "How could I understand how an innocent man could sign that confession and destroy his own life." The film received very positive reviews from most critics. The review aggregator websites Rotten Tomatoes and Metacritic both scored the film very highly, with Rotten Tomatoes giving it 94% and a 'certified fresh' rating, while Metacritic has given it 84% and a 'universal acclaim' rating. Upon its release the film proved controversial for some historical inaccuracies and for fictionalising parts of the story and Jim Sheridan was forced to defend his choices. In 2003, Sheridan stated: "I was accused of lying in In the Name of the Father, but the real lie was saying it was a film about the Guildford Four when really it was about a non-violent parent." In the film we see Gerry and his father Giuseppe (in the closing credits, the name is misspelled 'Guiseppe') sharing the same cell, but this never took place and they were usually kept in separate prisons. The courtroom scenes featuring Gareth Peirce were also heavily criticised as clearly straying from recorded events and established British legal practices since, as a solicitor and not a barrister, she would not have been able to appear in court as shown in the film. Furthermore, Peirce did not in fact represent Giuseppe Conlon. Investigative journalist David Pallister wrote, "the myriad absurdities in the court scenes, straight out of LA Law, are inexcusable." The soundtrack of the film includes the song "You Made Me the Thief of Your Heart" performed by Sinéad O'Connor and written by Bono, Gavin Friday, and Maurice Seezer. It also includes "Voodoo Child (Slight Return)" performed by The Jimi Hendrix Experience. However, the Bob Dylan Song "Like a Rolling Stone" was not included on the album due to licensing restrictions. 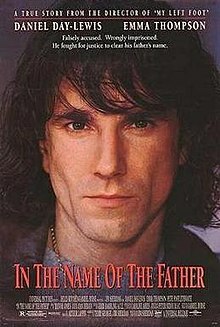 ^ "In the Name of the Father at Box Office Mojo". Retrieved 29 September 2010. ^ Pallister, David (19 October 1999). "An injustice that still reverberates". The Guardian. Retrieved 12 July 2011. ^ The Irish Filmography 1896-1996; Red Mountain Press; 1996. Page 59. ^ EmmaGennaro (7 May 2008). "Daniel Day-Lewis - 'Movies 101' Part 3" – via YouTube. ^ EmmaGennaro (8 May 2008). "Daniel Day-Lewis - 'Movies 101' Part 4" – via YouTube. ^ "In The Name Of the Father Reviews". Rotten Tomatoes. IGN Entertainment, Inc. Retrieved 28 February 2012. ^ "In the Name of the Father Reviews". Metacritic. CNET Networks, Inc. Retrieved 28 February 2012. ^ "Berlinale: 1994 Prize Winners". berlinale.de. Retrieved 15 June 2011. ^ Merritt, Stephanie (11 October 2003). "In the pain of the father" – via The Guardian. ^ Pallister, David (Spring 1994). "In the Name of the Father". Vertigo Magazine. London: Close-Up Film Centre. Retrieved 28 March 2016.